The Waipio Valley of Hawaii’s Big Island is lush and historic. Referred to as the Valley of the Kings, it’s an important place in Hawaiian culture and history. 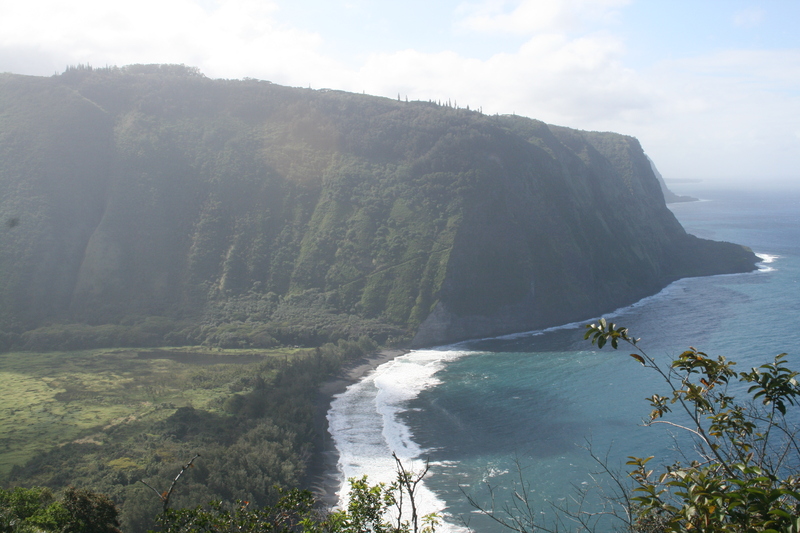 From the Waipio Valley Lookout, you will discover one of the most beautiful places in the world. The Waipio Valley is sparsely populated, but remains home to approximately 50 residents. Steep cliffs, a black-sand beach and a fertile valley filled with waterfalls, streams, taro fields and spectacular views surround you. Even on a cloudy day, the bright greens with the sound of the pounding waves are a feast for the senses. The Waipio Valley lookout is located off Highway 240 at the town of Honokaa. Follow it to the dead end. The road down from the lookout is accessible only by four-wheel drive and is very steep. The grade of this road is approximately 25 percent, so a regular car is out of the question. There are other options such as a an official tour–shuttle service in a four-wheel drive van followed by a tour with experienced guides on horseback in the valley. Hiking is also an option if you have the time and ability to spend hours and make the mile-long trek, which is certainly more difficult on the way up than on the way down.